Wow! I’m loving this coupon. 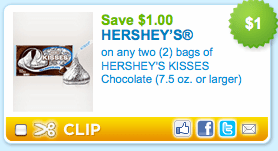 Save $1.00 on two bags of Hershey’s Kisses (print two). I love baking peanut butter cookies and putting a chocolate kiss on top.